We’re at that odd point in the season where summer is rapidly coming to a close but fall hasn’t quite arrived. We treasure the days of sunshine but can almost detect a chill about to come and the scent of apples and spice baking in the oven. There’ll be plenty of time for pears and chocolate and pumpkin in the months ahead, but for now, let’s take some time to cling to the next family about to leave town, the Plums. I seem to be making a lot of cakes lately. But this one is more of a brunch type pastry. 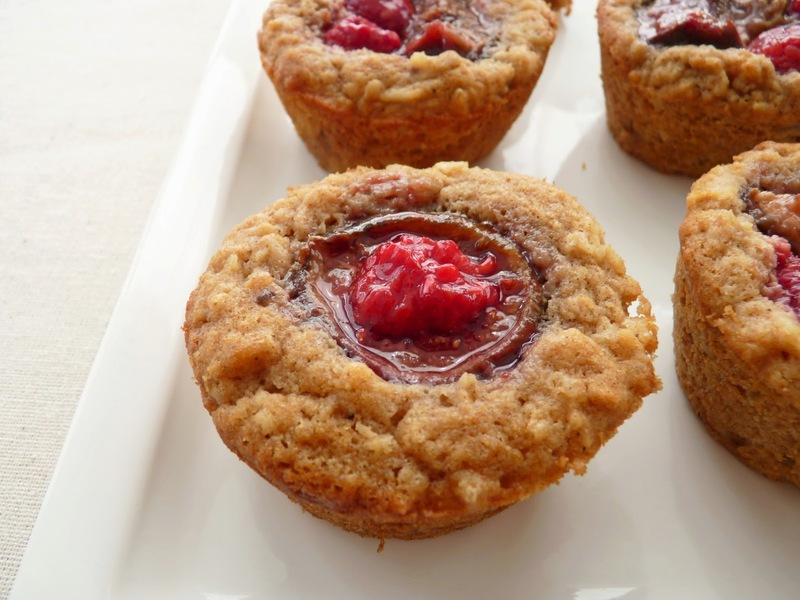 It’s made with a touch of oatmeal to please us oat lovers and to add a bit of chewy texture. And since I’m on this fresh plum jag lately, I had to include some of those deliciously tart gems. 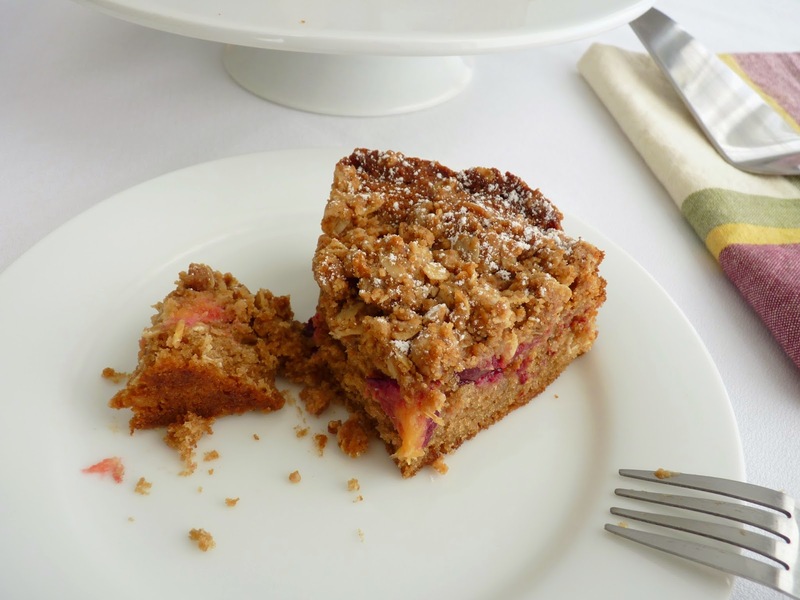 I’ve also topped the whole thing with a spiced oat crumb streusel for another layer of texture and to mediate the tartness of the plums. I think the cake has just the right touch of the complementary flavors of cinnamon and almond extract to make it pop. Do grab a fork and pass the coffee. It’s time to savor these warm days and cool nights. The Plum Family is nearly on their way. 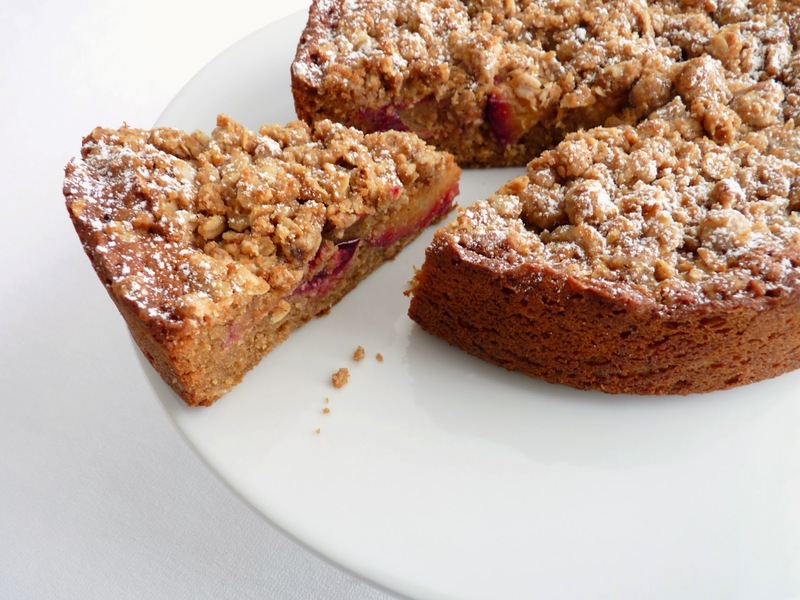 - I prefer springform pans when there is a streusel or crumb topping to prevent disrupting it while removing the cake from the pan. - After creaming the butter and sugar until light and fluffy, add the eggs one at a time, scraping down the bowl half-way through. You’re ready to add the second egg when it looks completely combined and there is no shiny egg sheen on the batter. When you add the vanilla and almond extract, it may look a bit curdled but that will iron out when you add the dry ingredients. - Plums should be ripe but firm. If they’re overripe, they’ll mush up the cake. Cut them into 1/2” slices so they bake to a nice texture by the time the cake is ready. 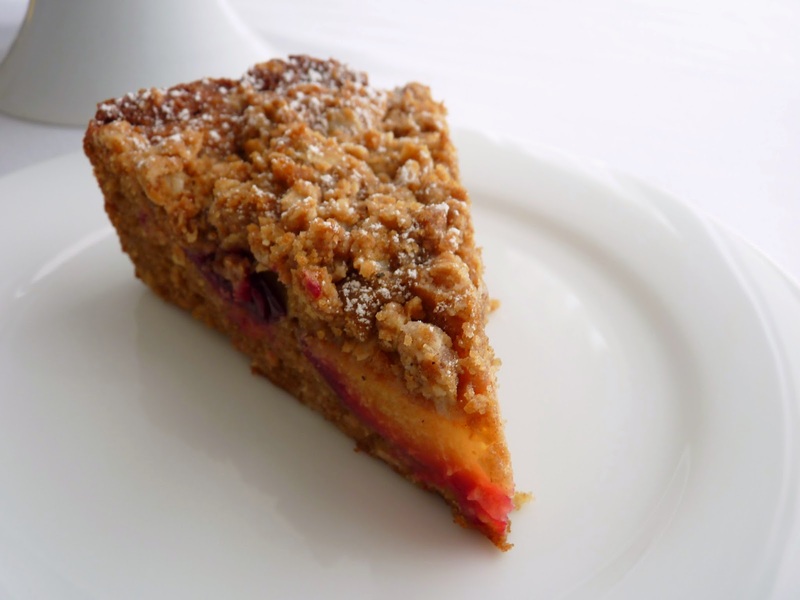 - When you test the cake for doneness, test it toward the center in an area that is cake, avoiding the plums. Preheat oven to 350 degrees F. Lightly grease a 9” springform cake pan. For the crumb topping, whisk together all the dry ingredients. Add melted butter and molasses and stir with a fork just until the mixture clumps together and is crumbly with large and small chunks. Chill until ready to use. Cut the plums into 1/2” slices and set aside. For the cake, whisk together the flour, oats, salt, baking powder, baking soda and cinnamon. Cream the butter and both sugars until light and fluffy, about 2 – 3 minutes. Scrape down the sides of the bowl. Add eggs one at a time, mixing thoroughly after each addition. Scrape down the bowl and add vanilla and almond extracts. Add the dry ingredients in 3 additions, alternating with half the milk and beginning and ending with the dry ingredients, scraping down the bowl as necessary. Pour the batter into the prepared pan and spread it out evenly. Press the plum slices about 3/4 of the way into the batter. Sprinkle the crumb topping over the entire cake. Bake until a toothpick inserted comes out clean, about 45 - 50 minutes. Cool for about 10 minutes on a wire rack. Then run a thin knife around the edge of the cake and remove the springform cake pan ring. Cool completely. Sprinkle with a very light dusting of powdered sugar. Whoa! 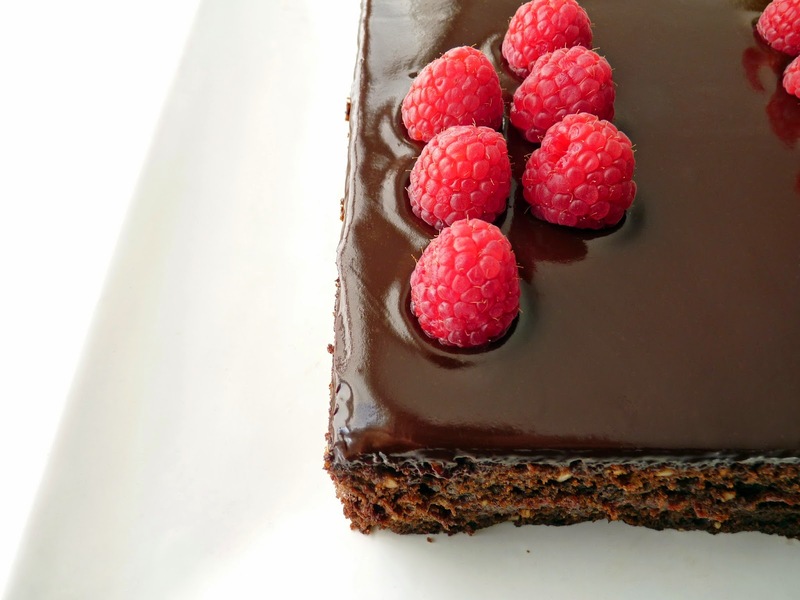 This week marks Pastry Studio’s 7th blog anniversary, so I’m going all in with a chocolate cake to celebrate. As I look back over time, I’m super grateful for all I’ve learned about blogging and the art of pastry and desserts, a constant lesson. What started out as a way to stay involved in a profession I loved as I returned to consulting in my previous career became an engaging and soul soothing pursuit of the senses. Seven years of testing, writing, photographing, blogging and a labor-of-love cookbook later, I’m still as infatuated with the tools of the trade as ever. My anniversary pastry is a conspiracy of cocoa, almonds, raspberries and chocolate, old friends assembled for a delicious reunion. It's a simple oil cake mixed in a bowl to which I’ve added toasted ground almonds. The filling is made with fresh raspberries macerated in sugar and lemon juice. The cake is finished in a sumptuous chocolate glaze to bolster the sensation of chocolate and lend a silky high note to the chorus. Thanks for all the wonderful emails and kindnesses from my readers over these last seven years. It’s been such an incredible pleasure to be here. Have a piece of cake and please make sure to enjoy all your endeavors in your kitchen. Cheers! - Use an 8” square pan that has at least 2 1/4” sides. - Mixing cocoa powder with hot water helps to “bloom” the flavor. I prefer to use hot water rather than coffee in cakes made with cocoa powder because I think coffee tends to muddy the taste. - I like to use sliced almonds because they grind to a finer consistency in a food processor. - To toast sliced almonds, spread them out in a single layer on a baking sheet and place in a 350 F degree oven for about 5 – 7 minutes. Watch them closely as they will burn quickly. - The cinnamon helps enhance and round out the cocoa flavor. - I invert the baked cake onto a small removable tart bottom to make it easier to handle. I also dust the metal disc very lightly with cocoa powder beforehand to prevent sticking. Once the cake is glazed and trimmed, I use a large metal spatula to help transfer the cake off the metal bottom and onto a serving platter. - For the chocolate glaze, finely chopping the chocolate into very small bits ensures it will melt more evenly, quickly and lump free. When the hot cream is added, let it sit for about 1 minute so the chocolate can absorb the heat. Then stir gently and slowly, starting in the middle and working outward in concentric circles, to prevent it from cooling down too fast and creating air bubbles. As soon as the glaze is blended, flood the center of the cake quickly and then move to the edges. - Square cakes are harder to glaze, so after pouring on the glaze, I grab the sides of the cake and shimmy and shake the whole thing vigorously so the glaze spreads out and covers the surface. Messy but fun. - I’ve chosen a square format but it can be baked as a round cake just as easily without the need for trimming. Use a 9” x 2” round cake pan and check it at about 35 minutes. Increase the glaze as follows to cover the entire cake: 5 oz semisweet chocolate, 3/4 cup heavy cream, 1 tablespoon corn syrup, 3/4 teaspoon vanilla. To glaze the cake, pour the glaze quickly in the center of the cake and then around the edges. Let it run for a few seconds and then gently jiggle and tap the baking sheet on the work surface to encourage the glaze to run down the sides of the cake. Just as it begins to dry, run a small flat spatula around the underside of the cardboard round to smooth the bottom edge and prevent “feet” from forming. Let the glaze firm up before serving. 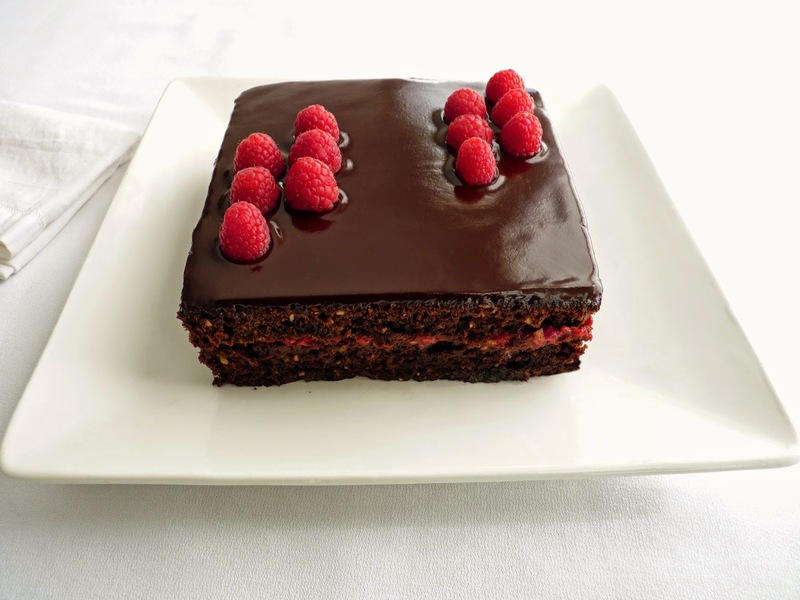 - The use of corn syrup in the chocolate glaze adds to the viscosity, ease of pouring and shine. I rarely use corn syrup but in this preparation it is a fairly small amount. You can leave it out if you wish. Preheat your oven to 350ºF. Lightly grease an 8” square cake pan and line with parchment with a slight overhang on two sides. Place the flour, sliced almonds, baking soda, salt and cinnamon in a food processor. Process until the almonds are finely ground. Set aside. Whisk together the oil, both sugars and eggs and blend well. Add the cocoa mixture and vanilla and almond extracts and mix thoroughly. Stir in the dry ingredients in 3 additions, alternating with half the buttermilk and beginning and ending with the dry ingredients. Mix just until well blended. Pour into the prepared pan and gently tap the bottom of the pan on the work surface to remove any air bubbles. Bake until a toothpick tests with just a few small moist crumbs adhering, about 40 - 42 minutes. Cool 10 minutes. Run a thin bladed knife around the edges and lift out the cake using the parchment overhang to assist. Cool completely on a wire rack. When ready to assemble, set aside a few raspberries for garnish and place the remainder with the sugar and lemon juice in a bowl. Mash them coarsely with a fork. Let them sit to macerate for about 10 minutes. Set up a baking sheet with a piece of parchment or a silpat and place a wire rack on top. Invert the cooled cake onto the rack and gently peel off the parchment. 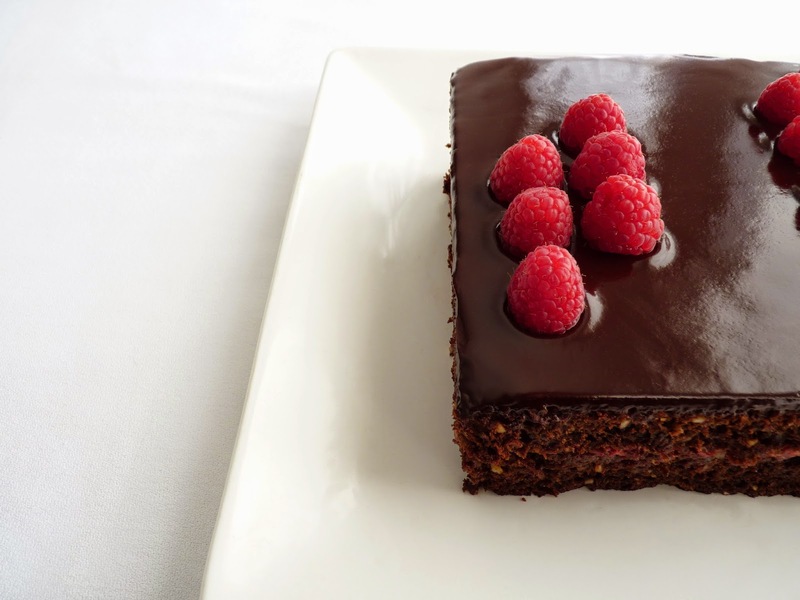 Using a serrated knife, slice the cake in half horizontally and set the top half aside. Spread the mashed raspberries evenly over the surface. Replace the top half of the cake. For the chocolate glaze, finely chop the chocolate and place in a heatproof bowl. Heat the cream and corn syrup on medium heat until it just begins to come to a boil. Remove from heat, add vanilla and pour over the chopped chocolate. Let it sit for a minute and then stir just until fully combined. Pour the glaze quickly in the center of the cake and then move outward toward the edges. Jiggle the cake to encourage the glaze to glide evenly across the surface. Once the top is covered, let the cake sit for 15 - 20 minutes. Using a serrated knife, trim the sides. Garnish with reserved raspberries. Does anybody know where the summer went? It seems like only yesterday we were anticipating stone fruit pie, shortcake and fresh homemade ice cream and now we’re nearly heading into September. Though we still have some peaches, nectarines, plums, berries and now figs to savor, it feels like the summer is slipping away, once again. Time does fly. This cake is a sort of lucky conspiracy of lots of odds and ends in my kitchen. There was fruit left over from other projects that needed to be used. I had egg whites and yogurt left over from ice cream experiments. So I decided to set to work to find a way to use all these ingredients in one simple preparation. As luck would have it, this cake turned out to be remarkably delicious. What started out as a waste not/want not mission turned into quite a luscious and beautiful dessert. The cake is a basic yogurt cake to which I’ve added some lemon and orange zest along with a dash of almond extract. The fruit layer is tossed with a bit of sugar to elicit some wonderful juices. I happened to have strawberries, raspberries, blueberries and a nectarine and that turned out to be a heavenly mix. I decided to finish the cake with a lavish crown of meringue for not only a sumptuous look but for an element of texture as well. First, I prepared the meringue. The best meringue starts with room temperature egg whites for maximum volume. I add a pinch of salt and some cornstarch to prevent weeping. A good ratio of sugar is required for the meringue’s structure and in order for it to set properly. Once it was whipped, I went with large spoonfuls dolloped in concentric circles but you can make swirls or pipe something fancier if you so desire. Then it went into the oven for a long and slow baking to dry it out and crisp it up. Once the meringue was ready, I baked the cake and then macerated the fruit. And here you can use any fruit of your choosing, the juicier the better. Then when you’re ready to assemble, simply whip up a gorgeous cloud of whipped cream and you’re all set. 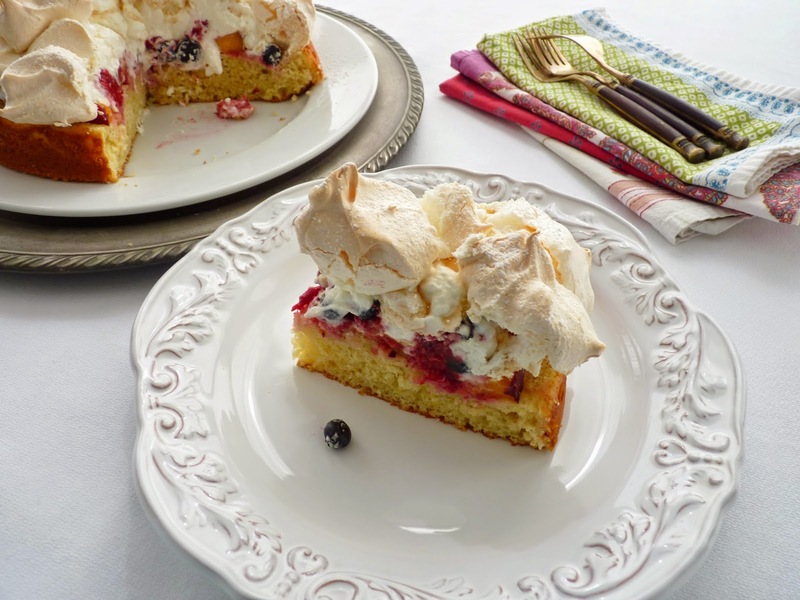 Layer on the fruit and juices, dollop on the cream and crown with meringue. Presto! The finished cake does look very festive and a bit regal. (I may have had a PBS show on the life of Marie Antoinette I’d watched the night before lingering somewhere in my mind.) But really, it's just a super good way to use up the odds and ends of summer. I hope you've all had a chance to enjoy the best pastries of the season. Cheers! - I used extra virgin olive oil in the cake but canola oil is a good alternative if you want a more neutral taste. - Raw egg whites can be stored in an airtight container in your refrigerator up to four days. Each egg white is 1 ounce, so weigh out 4 ounces for this recipe if you have a stash in your refrigerator. - Egg whites will whip with greater volume if they are at room temperature. Be absolutely sure your bowl has no trace of grease, egg yolk, butter, oil, nuts or chocolate present. Begin the process by whipping the whites with a pinch of salt until they are foamy and opaque. For a stable meringue, slowly add the sugar a couple tablespoons at a time and then keep whipping until they are glossy and form a stiff peak. It should hold its peak without slumping over. 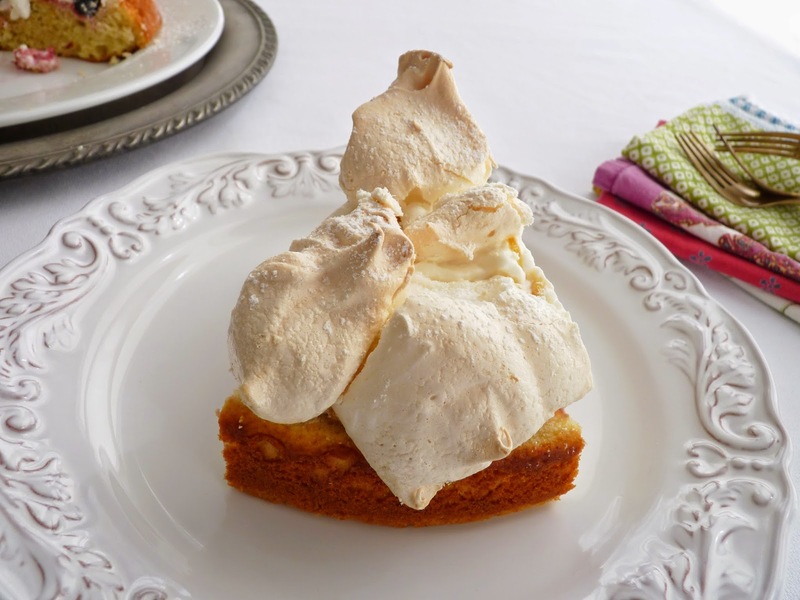 If the meringue starts to look dry and grainy and begins to separate, you've gone too far. - A pinch of salt helps to firm up the egg protein. Cornstarch acts as a stabilizer and keeps it from weeping. - The amount of sugar for the meringue does seem like a lot but its important for the structure. The sugar draws moisture from the egg white and helps it set. Superfine sugar works best because it dissolves more completely. You can make your own by running granulated sugar in your food processor until very fine, about 1 minute. - Once whipped, try not to handle the meringue excessively to avoid deflating it. 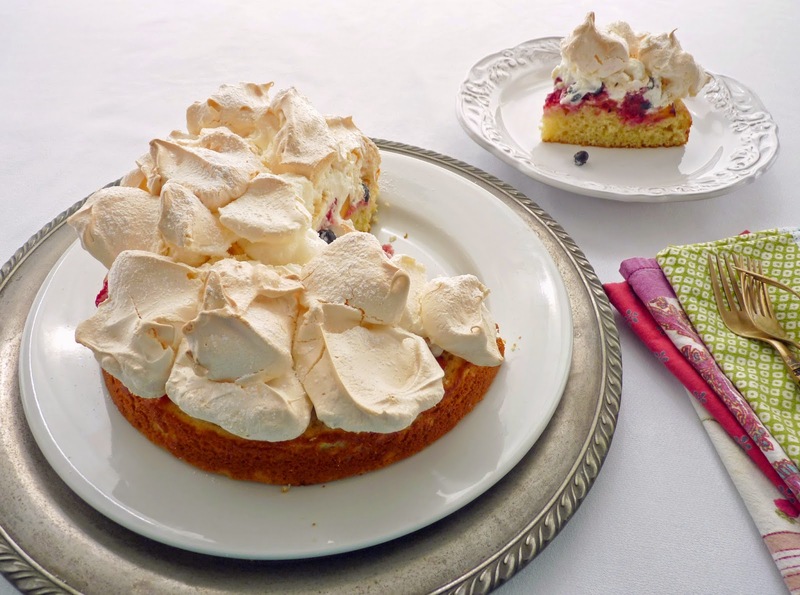 Once baked, meringue loses its structure and crispness and does not hold well in humidity, so best to prepare this when the air is dry. - To prevent the meringue from sticking to the parchment, very lightly dust the paper with cornstarch or a very light brush of oil. If you have the time, turn off the oven and let it dry out for another 1/2 hour, then remove to a wire rack and cool completely. Be gentle when removing from the parchment to prevent cracking. A long metal spatula can be a useful aid. 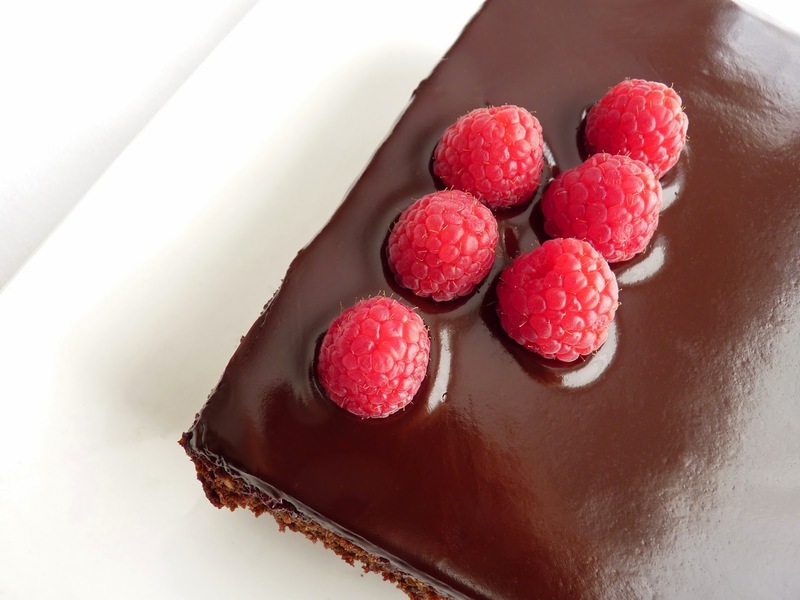 - Use a sawing motion with a serrated knife to cut into the finished dessert. For the meringue, preheat oven to 200 degrees F. Using the bottom of a 9” cake pan, trace one circle on a piece of parchment paper using a dark pencil. Place the parchment pencil side down on a baking sheet. Place the egg whites in the bowl of an electric mixer and whisk on medium low speed. When they're foamy, add cornstarch and a pinch of salt. Increase speed to medium high and continue whisking until they have increased in volume and are opaque. Slowly add sugar a couple of tablespoons at a time and continue whipping until meringue forms very stiff shiny peaks that hold their shape. Starting in the center of the circle outline, drop spoonfuls of meringue onto the parchment. Continue until the circle, using a light tough and letting it take its own cloud-like form. Place in the oven and bake for about 2 hours or until meringue is dry and can be released from the parchment. For the cake, preheat oven to 350 degrees F. Lightly grease 9” cake pan and line the bottom with a circle of parchment. In a separate bowl, whisk together the oil, sugar and eggs and blend thoroughly. Add the yogurt, vanilla and almond extracts and citrus zest. Mix in the dry ingredients just until there are no streaks of flour, being careful not to overmix. Pour the batter into the prepared pan and tap the bottom of the pan on a work surface a few times to release any air bubbles. Bake the cake until it's a light golden brown and springs back when touched or a tester comes out clean, about 25 - 26 minutes. Place on a wire rack to cool for 10 minutes. Invert the cake and gently remove the parchment. Invert again and cool completely. Slice the fruit and place in a bowl. Add sugar to taste and toss. Set aside for 20 minutes to macerate, tossing a couple of times to distribute the juices. To assemble, whip the heavy cream with the sugar and vanilla to soft peak. Use a serrated knife to slice off the dome on the cake and to expose the interior so that it can soak up the juices of the fruit. 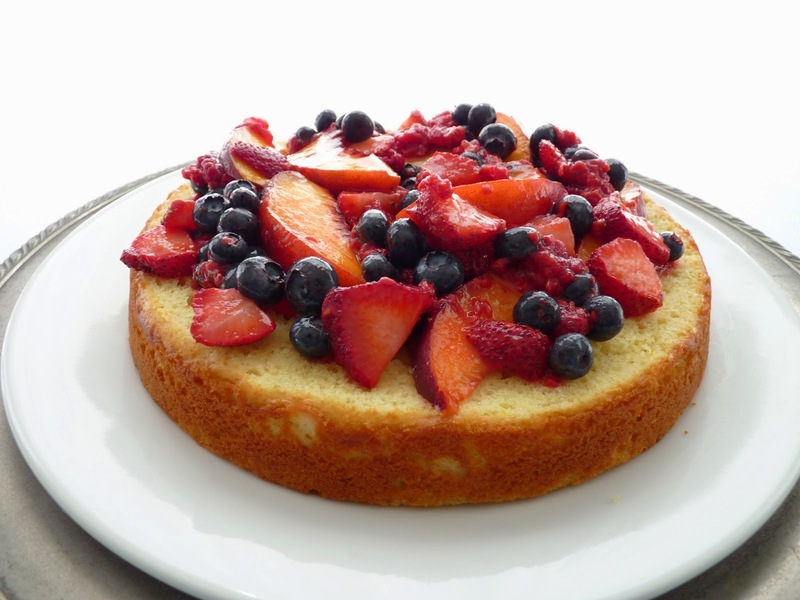 Place the fruit on top of the cake and dollop with whipped cream. Gently remove the meringue from the parchment and place on top of the cake. 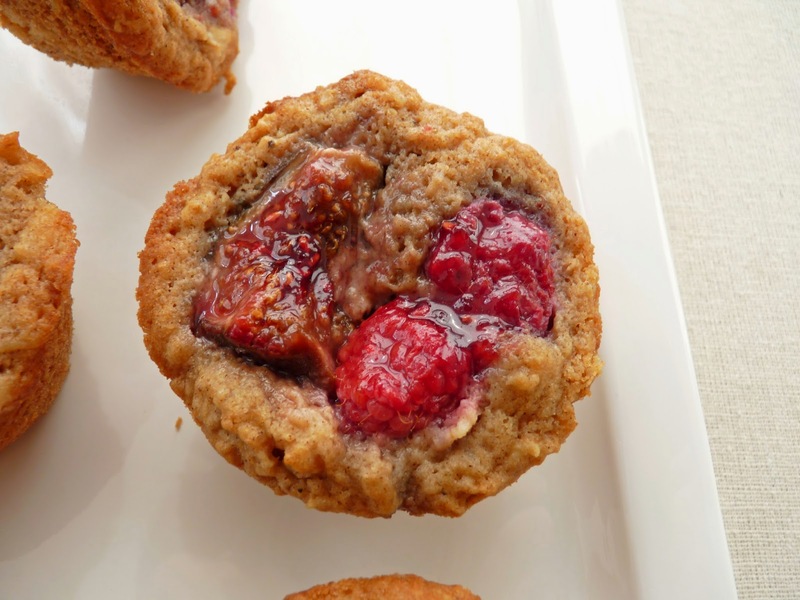 This is a reliable recipe for oatmeal muffins, a great alternative for breakfast, brunch or a grab and go snack. It’s a very simple and straightforward old-fashioned recipe mixed in a bowl and it couldn’t be any easier. Since my pastry table is abundant with fresh fruit of the season at the moment, I decided to add some slices of figs and fresh raspberries for a great variation. You could use any fresh fruit in your favor and produce a wonderfully moist and fabulous muffin. So grab what you have – slices of peach, nectarine, plum, banana or blueberries would be especially good - and add some beautiful color, texture and flavor to your morning ritual. - I only soaked the oatmeal for 1/2 hour because I definitely wanted some chew to the texture. - I used dark brown sugar instead of light. I prefer the stronger caramel notes. - Use ripe (not mushy) fruit for maximum flavor and texture. - The muffins aren’t particularly sweet. Since I was using raspberries, I sprinkled them with cinnamon sugar before baking. Raw sugar would also be nice. - The original recipe calls for 1/2 cup dried currants. - Although the recipe baking time is 20 minutes, mine were done in 13 minutes, so keep your eye on them. - These are best eaten the same day. 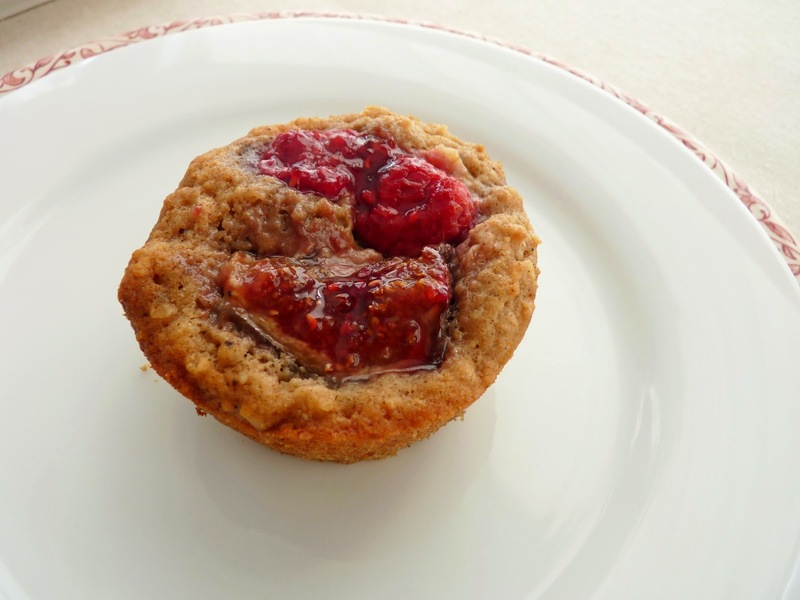 - Another delicious muffin: Buttermilk Bran Muffins. - In addition to my Recipe Index, I've added a search box in the right hand column. Many thanks to reader Kristen for the suggestion. Combine oats and buttermilk in a bowl and let stand for 1 hour [I let it sit for 1/2 hour]. Preheat oven to 400 degrees F. Lightly grease standard muffin tin. Whisk together egg, sugar, melted butter and vanilla. Add to oat mixture and stir together. Sift together flour, salt, baking powder, baking soda and spices and add to oat mixture. Stir just until combined. Portion the batter evenly in the prepared muffin tin. Cut the figs into quarters and insert each one into the batter along with a couple of raspberries. Sprinkle with cinnamon sugar. Bake until golden and a tester comes out clean, about 20 minutes [mine were done in 13 minutes]. Cool on a wire rack for 10 minutes and then remove from the muffin tin. 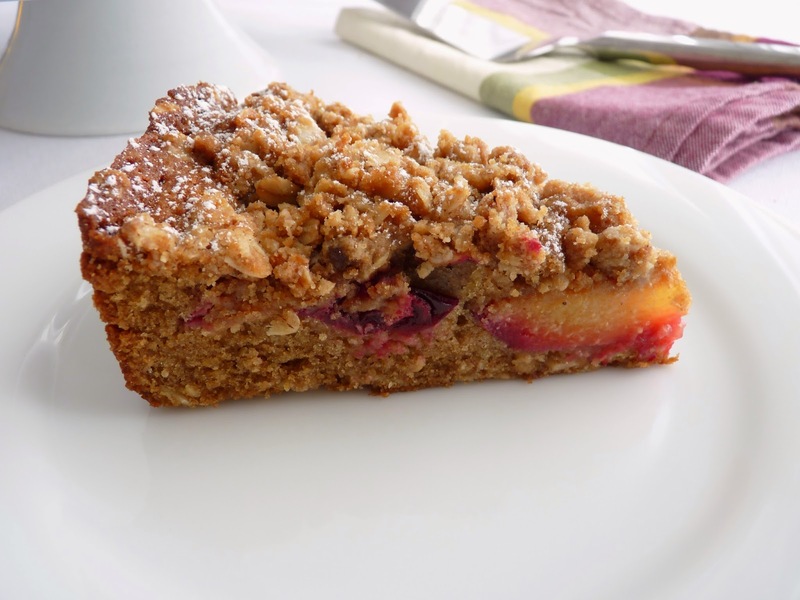 and cakes, such as Banana Sauce Cake, Almond Cake and Peach Sauce Cake, with delicious success. So I suppose it makes perfect sense that I needed to try Brown Butter Ice Cream, only a matter of time. If you’re thinking "butter ice cream" sounds a little too over the top, you’re not alone. I wasn’t sure if it would work for me since I prefer desserts that are not overly rich in fat or sugar. But browned butter carries such a magnificent flavor, I had to experiment. And OMG, am I glad I did. This is truly sensational ice cream. It’s important to get the butter to a nice deep amber brown stage for the best possible flavor. And since butter is the star, I keep the fat from the egg yolks and heavy cream to a minimum. I use unsalted butter so a nice pinch of salt is warranted to boost the flavor; I wound up using about 1/4 teaspoon. I also add a measure of brown sugar and I think it really adds to the lusciousness, producing a hint of butterscotch, only much better. In my testing trials, I included some vanilla in one batch but I found that it overwhelmed the basic delicious flavor too much so I leave it out altogether. Well, move over vanilla. There’s some very serious competition in town. - Use your favorite brand of butter. You should be able to smell its delicious freshness when you open the package. - For a good illustration of how to brown butter, see the guidance at Simply Recipes. Use a stainless steel pan so you can keep a close eye on the browning because it can burn pretty fast. Once you begin to detect a nutty aroma, it’s just about ready. I lift the pan off the heat and swirl for more control if I think it’s browning too fast or nearly done. It will continue to brown once you take it off the heat so pour immediately into a heatproof bowl to stop the cooking. - To prevent scrambled eggs, the browned butter should be cooled (not hot!) but still liquified when you’re ready to add it to the egg mixture. It’s important to add it to the egg and sugar mixture rather than at the end of the cooking process because it needs to emulsify with the fat of the egg yolks. This prevents the butter from separating and forming grainy globs of fat when the ice cream is frozen. - Once you’ve combined all the ingredients and returned the ice cream base to the stove, you don’t want it to boil, so constant stirring is necessary to keep it moving, preventing it from heating too fast and turning into scrambled eggs. I use a wooden spoon in the shape of a large rubber spatula when I’m cooking ice cream bases. It’s perfect for making sure you're scraping the whole bottom of the pan continuously and to gauge when you have a clear track. 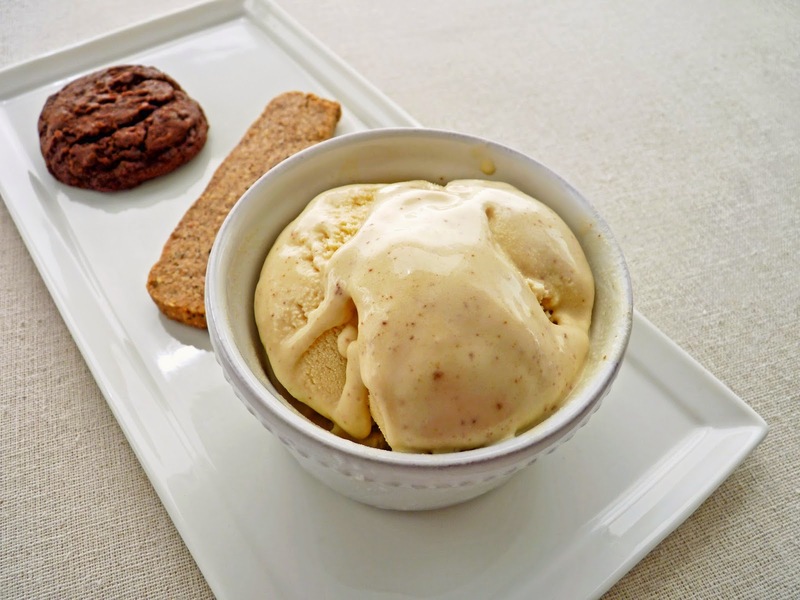 - Because homemade ice cream doesn’t contain any commercial emulsifiers or softeners, let the ice cream sit at room temperature for about 10 minutes to soften before scooping. 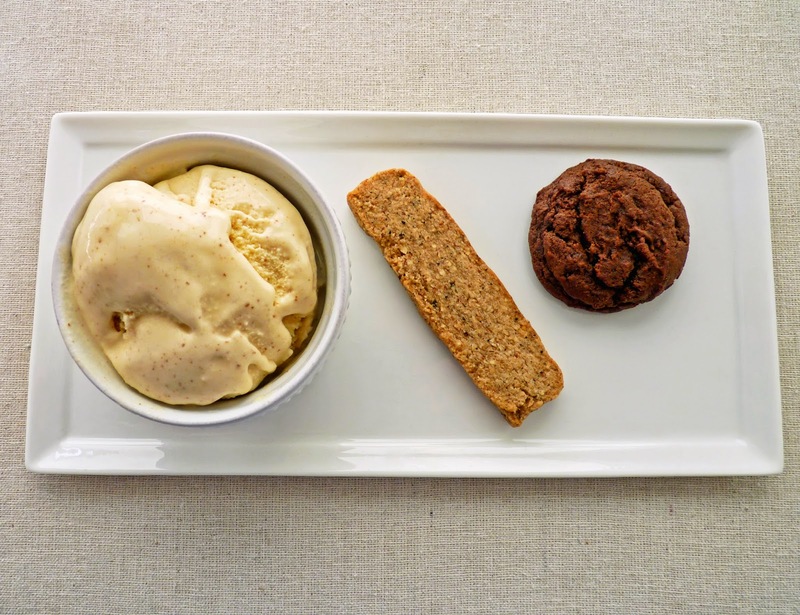 - The cookies featured in the photos are Saucepan Fudge Drops and Hazelnut & Olive Oil Sticks. 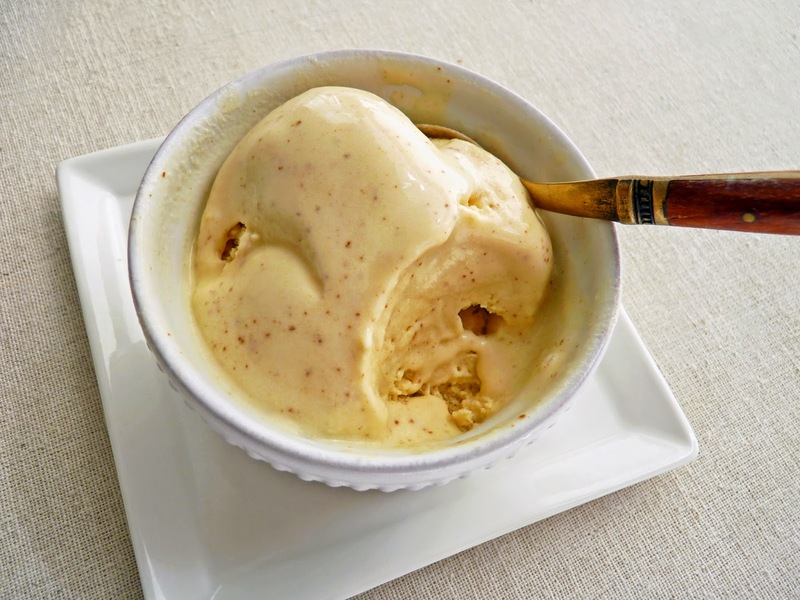 - This ice cream would go hideously well with apple pie, crisp or galette, Apple Brown Betty, all kinds of cake, banana nut bread, on and on. 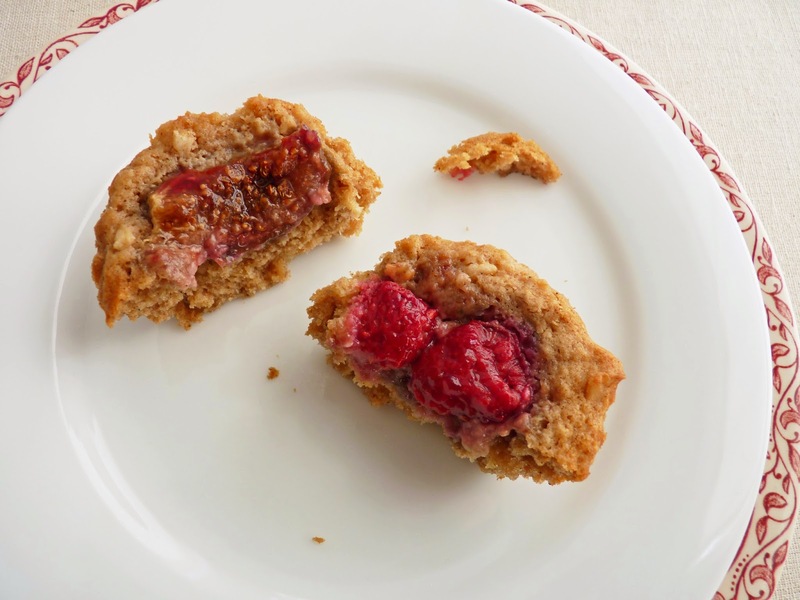 It would also make a great ice cream sandwich with chocolate chip, oatmeal or nut cookies. - I’m also very tempted to serve this with cinnamon toast crumbles, a la Cinnamon Toast Ice Cream. Cut the butter into small pieces and place in a stainless steel pan. Brown the butter to a fairly dark amber and then pour immediately into a heatproof bowl to stop the cooking and to cool. Place the cream, milk and a good pinch of salt in a saucpan and bring to a slow simmer. In a bowl big enough to hold all the ingredients, whisk together the egg yolks, granulated sugar and brown sugar until lightened and thoroughly blended. Slowly whisk in the liquid browned butter until the mixture is fully combined and emulsified. Slowly add the warm cream mixture, whisking constantly. Return the mixture to the saucepan and cook over medium heat, stirring and constantly scraping the bottom of the pan, until the custard thickens and coats the back of the spoon or spatula and a finger traced through it leaves a clean track. Pour into an airtight container. Taste and adjust for salt. Cool completely, cover and refrigerate until thoroughly chilled, preferably overnight. Freeze in your ice cream maker according to instructions. Pour into an airtight container, press a piece of plastic wrap onto the surface, cover and place in your freezer to firm up. 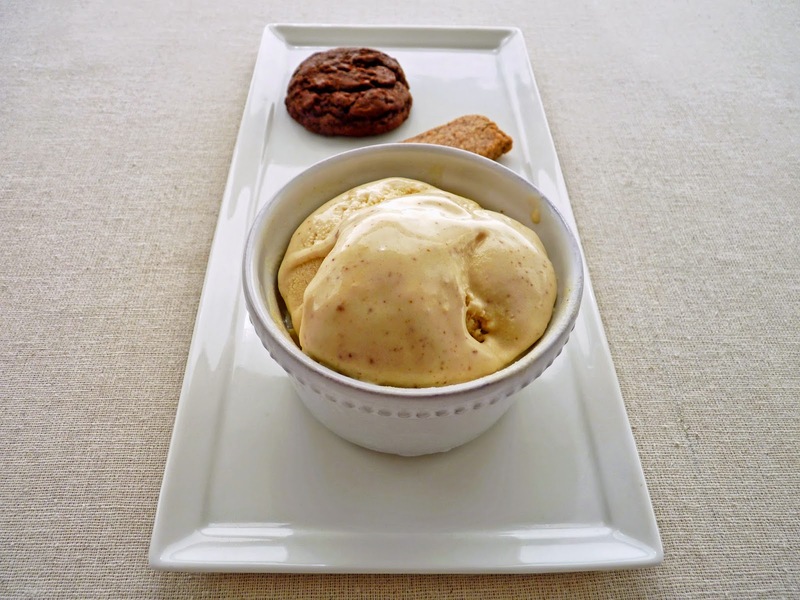 Let the ice cream sit at room temperature for about 10 minutes to soften before scooping.